Lucknow, largest city and capital of Uttar Pradesh, is affectionately known as the city of Nawabs. The city is known for its hospitality and culture, but being a city of northern India, its climate can be inhospitable during the summers. The city has dry and hot summers which make enjoying your well-earned weekends troublesome. The good news is that it is surrounded by pleasant weekend getaways on all sides. Well, here is a list of hill stations to visit near Lucknow for you to plan a relaxing trip. The nearest hill station to Lucknow is Chitrakoot in Madhya Pradesh at a distance of 231 km. However, Chitrakoot is more than just a hill station; it also holds great spiritual significance. Located in the Vindhya Range of mountains, legend has it that Hindu God Rama, his wife Sita and his brother Lakshmana spent a few months of their exile in the forests of Chitrakoot. 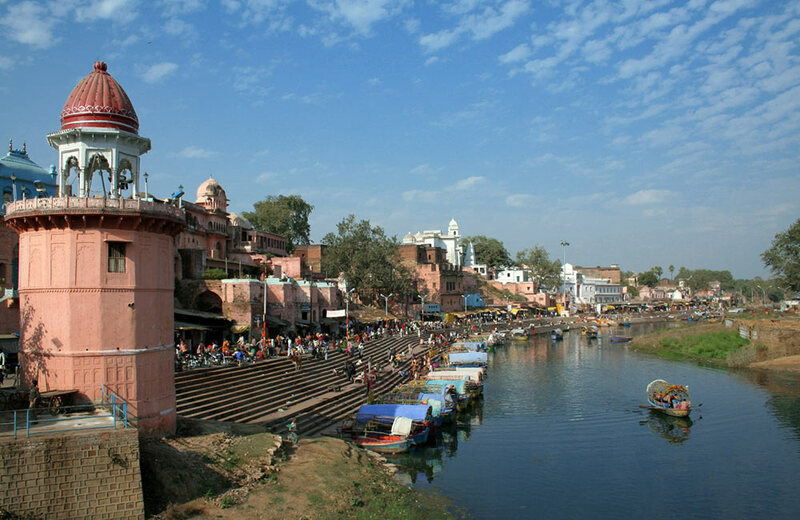 Therefore, a lot of the tourist spots in Chitrakoot are religious; places such as Ramghat, Kamadgiri, Bharat Milap Temple, Janaki Kund, SpaticShila, Gupt-Godavari, Pampapur, Hanuman Dhara, and Sati AnausyaAhsrama. However, Chitrakoot also offers scenic view of mountains covered with dense forest. If you feel adventurous, then you can also participate in hikes and treks organized locally by tour guides and companies. 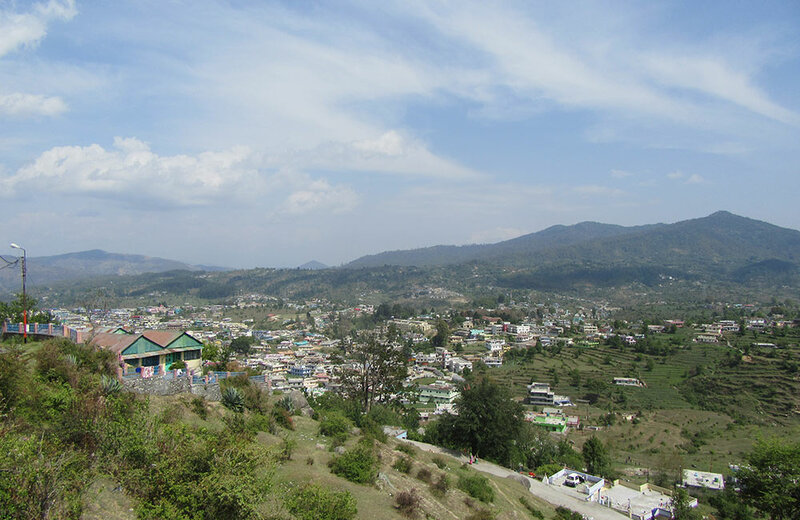 The town of Champawat is located at a distance of 286 km from Lucknow and at an elevation of 1615 meters. Champawat is an excellent place to be visited all year round. The temperature is moderate and pleasant during the summers, and quite cool during the winters. In addition to being a tourist attraction, the town also holds significant religious importance. Champawat is believed to be the place of Lord Vishnu’s ‘turtle incarnation.’ Places of attraction in here include Kranteshwar Mandir, Ghatku Mandir, and Shaani Mandir. Getting to Champawat, however, is not a walk in the park. The nearest airport is 160 km in Pantnagar while the nearest railway station is 58 km away in Kathgodam. Roadways are the best option of reaching the town, but taxis often refuse to take the journey. So, you can either go in your private vehicle, a private taxi, or state transport buses. In recent years, Champawat has become a popular spot for motorcycle enthusiasts due to an enjoyable climate, and winding roads. Bhimtal, named after Bhima, one of the Pandava brothers, is located at a distance of 375 km from Lucknow. The town of Bhimtal has a population of approximately 8000. Since it is not densely populated, it is an ideal place to enjoy some peace and quiet. Places worth visiting in Bhimtal include the Bhimtal Lake, Bhimtal Lake Aquarium, Victoria Dam, Lok Sanskriti Sangralaya, NalDamyanti Tal, HidimbaParvat, Bhimeshwar Mahadev Temple, and Sayad Baba Ki Mazar. Abbott Mount is located at a distance of 390 km from Lucknow, making it one of the nearest hill stations near Lucknow. It is situated at an elevation of 6400 feet in the Kali Kumaon region. 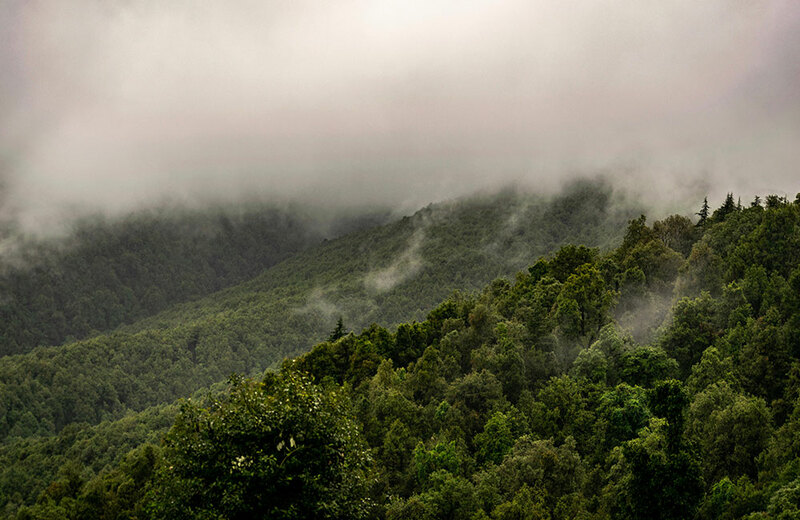 Surrounded by dense forest, the hill station offers spell binding views of nature. Far from the urban jungle, this hill station with a natural jungle offers a pleasant & refreshing escape from the fast-moving, concrete environment of the city. Nainital is one of the most popular hill stations in India. 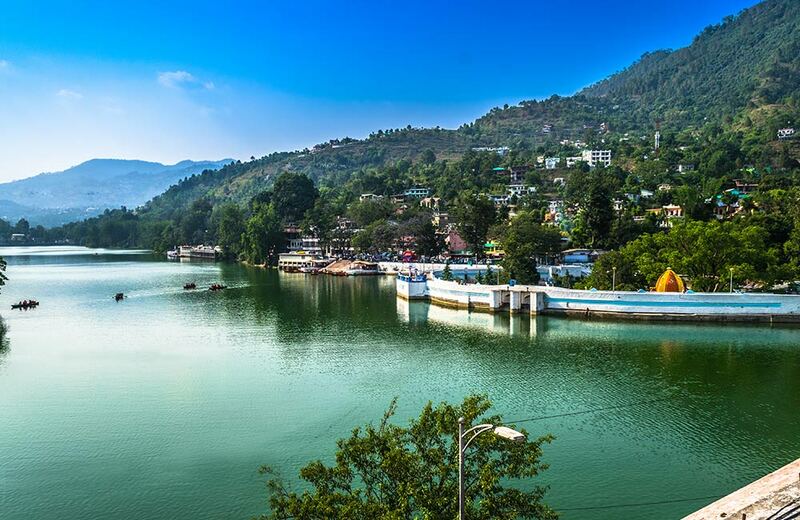 Located at a distance of almost 400 km from Lucknow, Nainital guarantees a tranquil environment to curb your stress. It is situated in a valley at an altitude of 2084 meters. 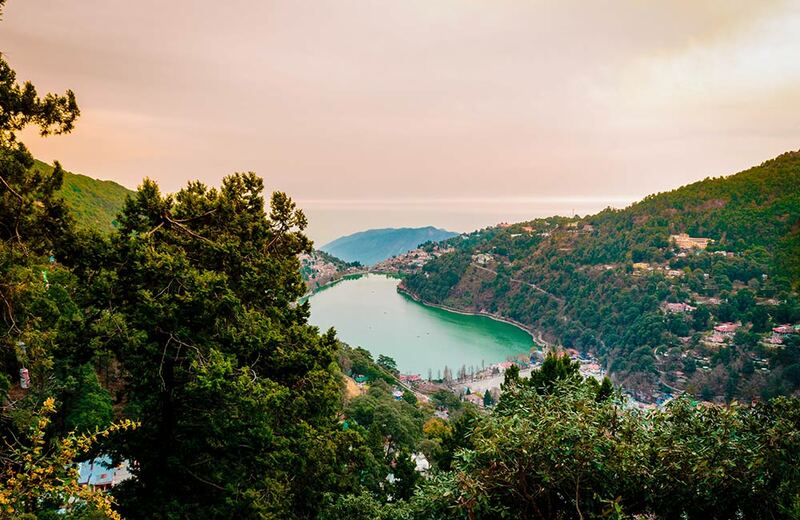 At the base of the valley is the Nainital Lake, a mango-shaped lake. The climate is cool all throughout the year and that makes it a particularly popular location during summers. However, the winters of Nainital are equally beautiful, if not more. Apart from the natural beauty, there are also other interesting places to visit such as the Naini Peak, Cave Garden, Snowview Point and more. Nainital, at an 8-hour drive, is one of the best weekend getaways near Lucknow. The town of Mukteshwar is one of the best hill stations near Lucknow. 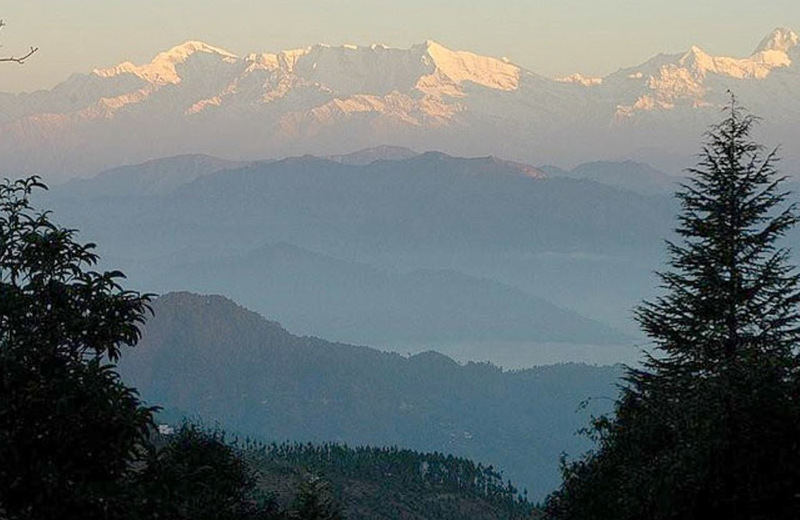 Situated at altitude of 2171 meters in the Kumaon hills, it is 51 km away from Nainital and 417 km from Lucknow. The town does not have too many tourist landmarks but the tranquility of the colorful landscape at Mukteshwar is worth the visit. It is the perfect place to leave all your worries behind and recharge yourself for the upcoming week of hard work. Auli, affectionately known as the Switzerland of India, is situated at an elevation of 2500 meters. The distance between Lucknow and Auli is around 432 km. Apart from offering cool climate throughout the year, this place is also known as the skiing destination of India. However, skiing is not the only thing to do in here. It is surrounded by a number of peaks that offer you a panoramic view of nature’s beauty. The Valley of Flowers near Auli is a sight to behold. There are also other places to trek and hike in the nearby hills, as well. But, if you have gone to ski, then you should know that the facilities are top-notch. There are chairlifts, cable cars and ski lifts for the skiers, and if you want to learn, there are a number of trainers that will be happy to assist you. Almora in Uttarkhand not only offers peaceful and magnificent view of nature, but it is also a place that offers spiritual peace. At a distance of 435 km from Lucknow, it is situated at an elevation of 1861 meters. 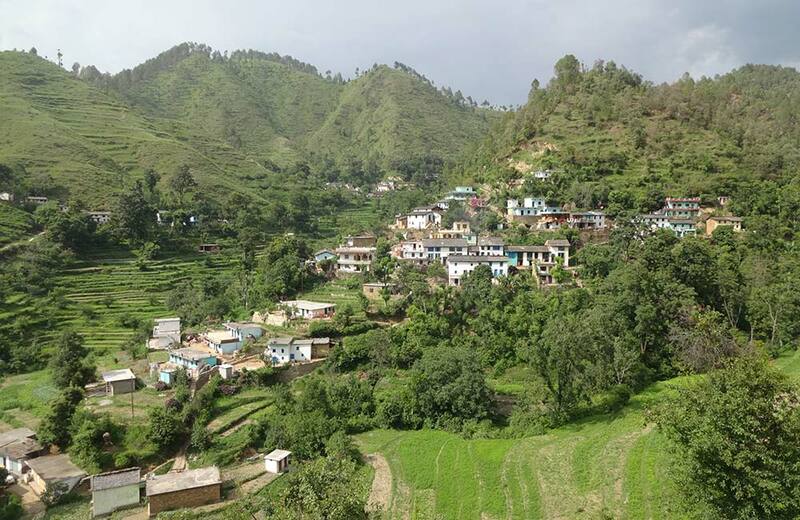 The temperature of Almora is moderate throughout the year, and can reach up to 35 degree centigrade in summers. While Almora might not be the coldest hill station near Lucknow, it still offers a cool environment. 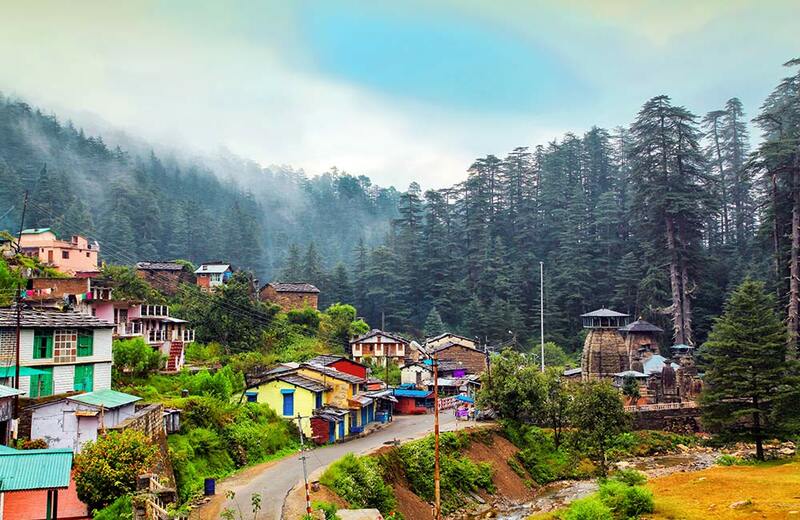 This place has deep roots in spirituality and is home to numerous temples, such as Jageshwar Temples, Nanda Devi, Paatal Devi, Chitai, Binsar Mahadev, Kasar Devi, Garhnath, Baijnath, and Rudreshwar Mahadev Temple. The picturesque town of Pithoragarh is affectionately called Little Kashmir by some. 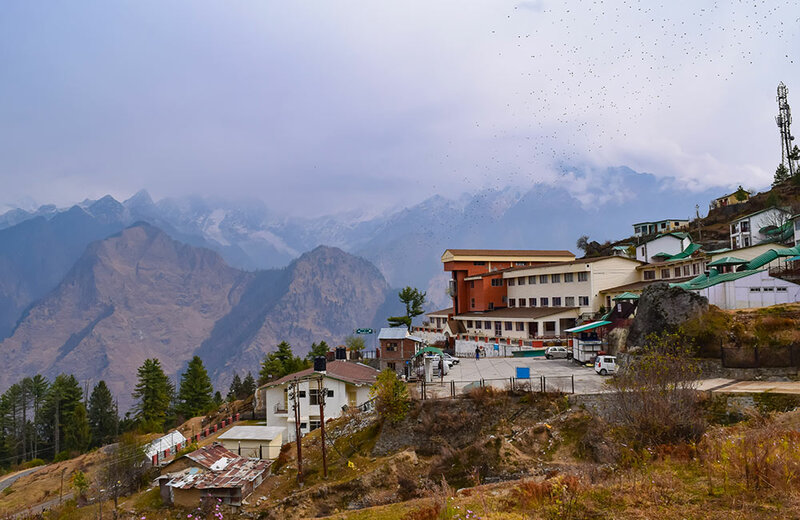 Pithoragarh is a small town famous for its view of snowy peaked mountains in December. It is about 446 km away from Lucknow at an elevation of 1514 meters. Apart from the mesmerizing view of mountains, there a lot of places of to visit, such as Kailash Ashram, Chandak Reserve forest, Mostamanu Temple, Kamakhya Temple, Maharajke Temple, Kapileshwar Mahadev Temple, ThalKedar Temple, Askote Wildlife Sanctuary, Pithoragarh Fort, and London Fort. 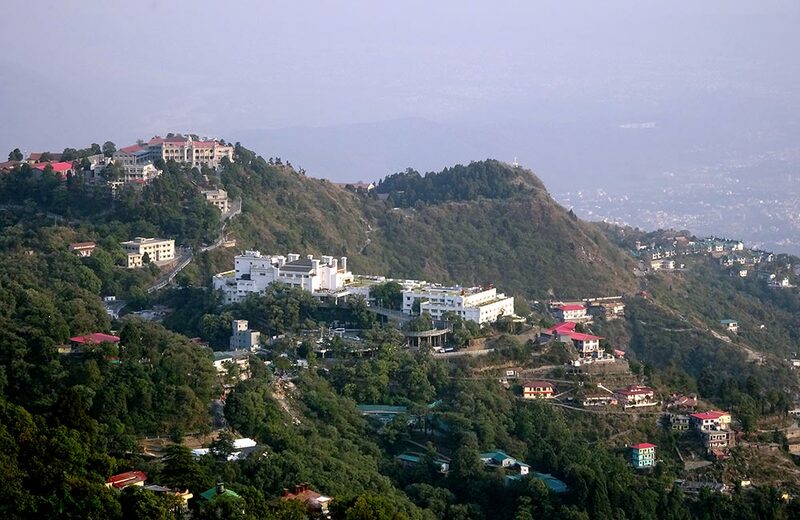 The Queen of the Hills, Mussoorie, is situated at the foothills of the Himalayan range at an altitude of 2005 meters, almost 600 km away from Lucknow. Mussoorie does not have an airport but the nearest airport is just 54 km away in Dehradun. So, you can take a flight from Lucknow to Dehradun, which will take less time compared to the travel from Lucknow to nearest hill station, Chitrakoot. In addition to the marvelous and numerous views of Mother Nature, the city has much more to offer. Sir George Everest’s House and Nag Devta Temple are worth visiting historical and religious landmarks. To spend some time with leopards and panthers, you can visit the Benog Wildlife Sanctuary. To engulf yourself with an assortment of scenic views, you should visit Mossy Fall, Bhatta Falls, Happy Valley, Gun Hill, Mussoorie Lake, Lake Mist, and Jharipani Falls – the list is long! If you live in Lucknow, nearest hill station will be at least a couple of hundred kilometers away. However, if you plan properly, you can visit any of the hill stations mentioned above over a weekend. If you are on a business trip or casual visit, staying in one of the hotels in Lucknow, make sure to visit any of the hill stations mentioned above. They are bound to provide you with a memorable and refreshing experience. While in the city, you must also check out our definite lists for historical places in Lucknow and famous restaurants in Lucknow.